Discovery is uncovering something that was already there, but you didn't know. It is synonymous with uncovering... removing the cover, removing the veil, seeing something without something covering it up, distance, clothing, or your filters. Innovation is taking something and bringing a new twist or improvement to it. In order to innovate, you need to discover first. Invention is entirely new. It's a new solution to a problem that could have been around for a long time. I consider myself an innovator, but today I realized that I may have an inventor hiding in me: I discovered the inventor in me... lol. The topic of this post is my innovation in the area of ambition. 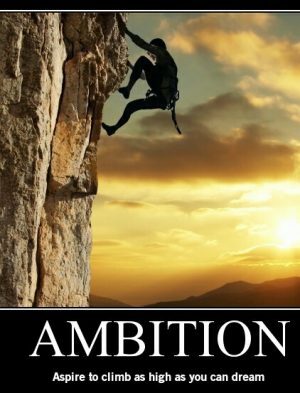 Ambition has gotten a bad rap among folks that consider it a cut-throat, climb over dead bodies politician activity or desire. It is further from the truth than most any misleading, bastardized distinction in history (maybe, lol). Ambition is the Human Spirit, the Life Force, the Soul's desire for the activity that makes it an Expanding Human Being. Let me break this down: ambition is NOT a desire for some outcome. It is not a desire to become rich, powerful, married, or free... no. Those are destinations, and the Human Spirit, the Life Force, the Soul are NEVER interested in a destination, they are ONLY interested in the kind of activity, the kind of journey that is expanding, that is challenging, that is growth. My students are not ambitious. And I don't know any single person who is ambitious, except myself. How would I know if you are ambitious, you ask? If you were ambitious then you would be in love with doing. I am writing a book (that I may never finish, unless I can make people ambitious first!) that teaches you how to gain an extra few hours a day when you could do the work it takes to learn a new profession, to learn a new skill, to get a new degree, or to just write books and publish them, learn to play a musical instrument, get rich through a business... or whatever strikes your fancy. Today I realized that if I gave you two extra hours, you wouldn't do anything useful with it. You complain that the day is short, because you filled it with useless, senseless, meaningless doings that will not make a difference for you or others. People don't go to sleep because they need to sleep: they go to sleep because they don't like to live... none of their doing is something that is worth staying awake for... Some of the time, when I am a little depressed, I am the same way. I go to sleep to not be awake. Escape life. But in my long life I have proven it to myself that I love the doing, by producing results that are out of the ordinary, out of what can be expected to get done in a lifetime... I have done enough for several lifetimes. Why? Because I am ambitious. I have the Life Force aboundantly working in me. If you are ambitious, you don't do things for any other reason that for the love of doing. When you do something in order to, that is not ambition. Ambition comes from the Soul, and soul isn't interested in the least in the end result, the goal, the gains, nothing. Soul is interested in growth without being attached to a growth result. So, what happened to humans that they lost their ambition? I am not very inquisitive by nature, not very philosophical in my bent. I am an engineer and engineers find solutions to problems other people find... mostly. Luckily to you, other people have asked these questions before, namely the author of the Anastasia series (The Ringing Cedars of Russia) and Neal Stephenson in the book Snow Crash. There could have been others, but all the philosophers I have read were asking the wrong questions and therefore got the wrong answers: scratched the surface only. But the two literary works actually got to the crux of the matter, especially Neal Stephenson. The crux of the matter is that, at some point in human history, a new meme, a new "thought form" was introduced, much like a virus, that created a separation between you and you. Between the aspects of you. A separation that severed the You that you consider yourself to be, from the You that is connected to All-of-It, that is the Witness, the Observer, the Soul, the aspects of you that are the source of your Life Force. Without removing that separation, that viral infection, you cannot become a Human Being again, a Human Being whose nature is to expand. The Unconditional Love Activator was my first attempt to bridge that gap created by the separation, to create synapses connecting your Witness, your Creator part with the You you consider yourself to be. Even the best of you has only bridged that to a degree of 40%. And although that is amazing (he did it in private sessions, by the way), the more synapses you activate, the more your connection is established, and the more your life comes out of that "Divine" aspect of you, and not the mundane, stressed, worldly, miserable, limited, goal-oriented cowardly you that just wants to have and not do, not work, not through effort. Will it work automatically? Yes. Will the opening stay open automatically? No. Unless you have enough reason to keep it open it won't stay open, a smidgen of ambition. Unless you can Witness it, it won't stay open. Unless you practice and use the new synapses, they won't stay open. When I had my brain damage, I was a "normal" human being: I had a brain with two hemispheres largely disconnected. I had no capacity to use my whole brain, and the left side of the brain didn't know what the right side was doing. No communication. Split. Normal. When, as a result of the Holosync free disc audio, the seizure I experienced in 2003, suddenly the dormant, unactivated synapses (that every human being has, millions of synapses, in fact,) came alive to prevent my brain from falling apart, I suddenly built a brain where the two hemispheres perfectly connected and started to communicate and cooperate. But here is the kicker: had I not challenged myself at that point, the synapses would have gone back to dormant. That is the nature of reality. Right after the "event" I started to challenge myself beyond what can be expected from a human being. I made my brain need all the connections it could use, and as a result I now operate with a whole brain; no left and no right. One brain, one will. I am not saying that you should go through a seizure here. I am saying that had I not forced my brain to make the synapse connections permanent, they would have disappeared. By the same token, you will need to exercise those connections, if you want to benefit massively from the "Unification" energy and start your journey to develop into a human being. Unless you challenge yourself, unless you start doing the activities an Expanding Human Being would do, you will lose the connections, even if you repeat the process every day. You have to change your life so your life needs that unified YOU. The energy will be available as a remedy, and as meditation. No audios for this remedy: I haven't been able to produce an audio that retained the energy. And, as with all new energies, this is going to go through testing. The first testings will be on the Path coaching calls, because we have those calls already established. Those people pay every month to be in that program. They are the most committed bunch I have. Once that testing is done, I'll make the energy available for purchase. PS: as I was looking for images for this post, I saw that Christianity is encouraging people to connect to God. But they imagine God somewhere outside, definitely not as an aspect of themselves. The god they worship is a judgmental god, a jealous god, a god that gives and takes away... exactly the opposite of what your aspect is: no judgment, no feelings, no demands... just unconditional love and witnessing. By the way, LOVE is not a feeling. And more importantly, god is not the label, the word "love". Update: I have been able to send the Unification energy through my empath connection to individuals, just like the DNA capacity activation. It's easy for me... and I am willing to do it for someone who has at least 10% on the Ambition Scale... a scale of 1-100. Get your Starting Point Measurements... and then you'll know. I was asking a lot of names, but they were all common words, but Unification is a rare word... just like all the names, all the handles of my other energies, so they cannot be called down accidentally. One of the names I considered a perfect fit, was ommm... after all, I think, repeating the word ommm came from the desire to connect to your separated self... unfortunately that is not successful: sound cannot break the barrier set up by the mind virus. good catch, thank you. I have fixed it. Thank you, Sophie, for showing up in my life with the courage, ambition, and love I need to grow. I am making ambition a good word in my vocabulary. Ambition for expansion, for growth, for life in abundance. Tired of being meek, dependent, depressed, and expectant. We are supposed to be horrified at it. Can we substitute ambition for greed? The ambition to grow, to expand, to become, to hasten evolution? that is what I think he means, ambition. though I haven’t see that move. thank you for this, John. Yes, Sophie, I would like to learn more about maximizing my time. I do think there is a way in which one makes time when something is important. I having been coming home every night this week and grabbing a quick bite and sitting down with my bass in preparation for Tuesday’s open mic. And it’s mostly been not so great, and that’s okay with me. I am learning and creating. I like what you said about ambition and doing. I have many ambitions and spend more then a fair amount of time “doing” but occasionally I find that I have been doing the wrong things. Right after the “event” I started to challenge myself beyond what can be expected from a human being. I made my brain need all the connections it could use, and as a result I now operate with a whole brain; no left and no right. Seizures can also damage brain cells so one could theorize that you may have lost a pathway that was blocking your cerebral left-right communication thus allowing it to function as an integrated whole post event. But that’s another discussion. LOL! So what exactly did you do to stimulate your reintegrated brain after the seizure.? In what ways does an expanded human being challenge the brain? As you point out, nobody wants to duplicate your seizure but others can learn from your experience. I think it’s great that you have an energy remedy for this but I agree that, in addition, there is always something proactive that an ambitious person should or could be doing. Thank you! I am sending you a personal email: I don’t want to say bad things to you publicly, I know how sensitive you are to your public image… lol. Using a brain so the whole-brain function remains active is refusing to use the mind. The biggest challenge for most. Next Next post: Ambition versus Desire… Why ambition has become a dirty word, and who does it serve?